Telly Wonders About Love . . . If you like this, you should check out my Telly post from last year. 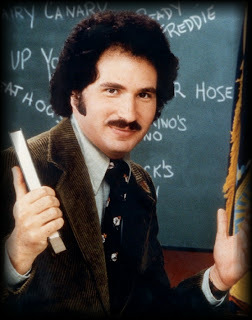 They finally released the entire first season of "Welcome Back Kotter" on DVD this week. I've been waiting for them to do this for a long time. I always loved this show. I did a 10 year stint at a high school where I worked as a Resource Room Tutor and believe it or not, I used a lot of techniques I learned from this show. Anyway, my copy came in the mail earlier this week and I'll soon have it cued up and ready to watch. In the meantime, I thought that I would post this single released by Gabe Kaplan to cash in on the Kotter craze back in the 70s. The first side is called "Up Your Nose" and is a disco-ish boogie that really makes you think that Gabe should just stick to comedy. Which he does on the flip side, a stand up bit about Bicentennial Minutes called, "Bye-Centennial Minutes". If you weren't around in 1976 I'll explain what a Bicentennial Minute is. Just like the "The More You Know" ads from the late 90s, the Bicentennial Minutes were short little minute commercials that featured celebrities talking about the history of our country over it's past 200 years. If you were around then, the B side of this single gets a laugh. If you weren't, I'd imagine that you won't get it. But I'll let you be the judge of that. Here is Gabe Kaplan's 1977 single, "Up Your Nose" along with it's B-Side, "Bye-Centennial Minutes" and the picture sleeve that it came in. Enjoy! Paul Lynde For The Win! The last post of Mel Brooks' film music had ironic timing. AMC played Young Frankenstein on their "DVD TV" series last night and I found out today, that the musical version of YF is opening in November! Interesting! It also made me think of one of my favorite albums. This was originally owned by my father and then passed down to me when I started hosting my own radio show in college. The show was a Dr. Demento type show that featured comedy records and song parodies. In between the songs, I would play random short snippets from this album. What album am I talking about, you ask? Why Zingers From The Hollywood Squares, of course! 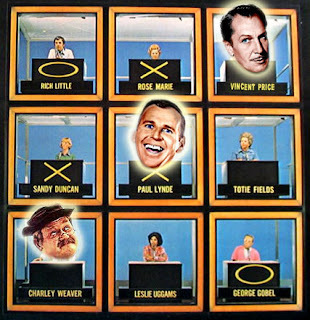 This is from the seventies incarnation of Hollywood Squares. (Thank god. I didn't care too much for the 90s revival) It features all of the regulars from that era including the center square, Paul Lynde. It also features some great remarks from Burt Reynolds, Charo, Rich Little and many others. How does this tie in with the last post? 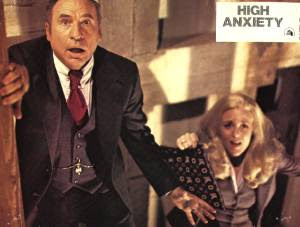 It also features Mel Brooks! Here it is for you now to listen and love as I have over the years. Enjoy! Last year I posted the opening segment to Nickelodeon's "Chapi Chapo" which was a featured bit on their "Pinwheel" program. Since then, youtube has grown so much that now there are complete episodes of the show online! Here's one of them. This is entitled "Les Fleurs". Enjoy! A great super 8 home movie reel featuring Top Cat in "Goofy Golf". Beautifully digitised by my good friend, Mark "Dangerboy" Nelson who added the delectable soundtrack (can anyone guess where the music is from originally?!) as well! Enjoy!